VietPress USA (Set 26, 2018): Today on Wednesday, President Trump held his first full press conference on American soil since the first weeks of his administration last year. It was a rare event that consisted of Trump speaking about a wide array of topics for nearly an hour-and-a-half. Trump’s appearance took place in a plush ballroom at Manhattan’s Palace Hotel, not far from the United Nations where he addressed the General Assembly on Tuesday. But foreign policy and his meetings with world leaders weren’t the top items on the agenda. Trump took this press conference to protect his Supreme Court nominee Brett Kavanaugh. In the very first question of the presser, Trump was asked for his assessment of the accusations against Kavanaugh. He dismissed them as a “big fat con job” and reiterated his support for the nominee. Trump was then asked a question he’d dodged at the United Nations earlier in the day, does he believe the three women who have come forward and publicly accused Kavanaugh of sexual misconduct are all lying? It was a rare event. On Wednesday, President Trump held his first full press conference on American soil since the first weeks of his administration last year. Like his earlier foray into the jaws of the media, the event consisted of Trump speaking about a wide array of topics for nearly an hour-and-a-half. It was a throwback to Trump’s days on the campaign trail where he regularly made marathon appearances in front of the media and in his signature rallies. But his responses left much unanswered. The press conference came amid cascading allegations of sexual assault against Trump’s Supreme Court nominee, Brett Kavanaugh, and two days after a slew of conflicting reports about the status of Deputy Attorney General Rod Rosenstein, who is overseeing the Justice Department’s Russia probe. By various accounts Rosenstein was on the verge of either resigning or being fired, but as of Wednesday evening he was still in his job. Both of these major developments seemed poised to come to a head on Thursday with Kavanaugh and one of his accusers scheduled to testify on Capitol Hill and Rosenstein heading to the White House for a meeting with Trump. In the very first question of the presser, Trump was asked for his assessment of the accusations against Kavanaugh. He dismissed them as a “big fat con job” and reiterated his support for the nominee. Trump was then asked a question he’d dodged at the United Nations earlier in the day, does he believe the three women who have come forward and publicly accused Kavanaugh of sexual misconduct are all lying? On Rosenstein, Trump was similarly evasive. The rumors the deputy attorney general was set to leave his job were sparked by a New York Times story that said Rosenstein discussed secretly taping the president and using the 25th Amendment to remove Trump from office. Even before this story, Rosenstein and the special counsel investigation into Moscow’s intervention in the 2016 presidential race had drawn Trump’s ire. The president, who has vehemently denied his campaign cooperated with the Russians has repeatedly referred to the probe as a “witch hunt.” Trump repeated that characterization at the press conference, but he paradoxically indicated he would “certainly prefer” to keep Rosenstein on the job. In the end, Trump offered no clear answer on Rosenstein and, in fact, said he might even postpone the meeting that was expected to settle his fate until after the Kavanaugh drama. In addition to the recent headlines on the home front, Trump’s time at the United Nations General Assembly did make major news. On Wednesday morning before the press conference, Trump accused China of having interfered in U.S. elections and expressed support for a two-state solution to the conflict between Israel and Palestine. Both of these topics came up at the press conference and, like the other major subjects he was asked about, they were met with inconclusive answers from the president. After Trump made his blockbuster claim about Chinese election interference at the UN Security Council meeting, the White House hastily organized a telephone briefing to explain the charge. The presentation largely focused on Chinese advertisements in an Iowa newspaper that criticized the Trump administration’s tariffs on that country. Those advertisements appeared to be legal efforts to sway public opinion, so many observers were underwhelmed by the White House case. At his press conference, Trump was asked if he had more substantial evidence to back up his accusation against China. He demurred and hinted further revelations could come out in the future. Trump was also asked to “compare the level of interference” he believes China is engaged in to what went on with the Russians in the 2016 presidential election. Along with the dodgy and inconclusive statements on major areas of interest, Trump mostly served up reheated commentary on his favorite topics, including the old standards about his dissatisfaction with the Iran deal, his belief much of the media is “fake news” including the “failing New York Times,” and his assessments that he has a “very large brain” and has had an extremely successful tenure. With daily briefings becoming increasingly infrequent, the White House press corps has been clamoring for a full presidential press conference. Since February 2017, Trump has only held these availabilities in Finland and Singapore. Instead, he has largely engaged with the press through joint conferences with foreign leaders where he only faces four questions from selected members of the media, and moments where he chooses to hold forth with pool reporters and the press that shouts questions his way when he departs for helicopter trips. Trump referenced the media’s dissatisfaction with that state of affairs during his press conference. 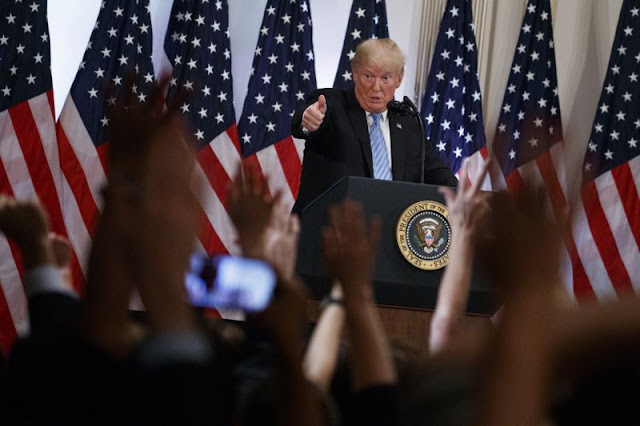 He claimed a reporter complained to him about his lack of pressers and argued he does them regularly since he often takes questions from the smaller pool of reporters that covers him at events. But those venues are far different since they involve a smaller number of reporters and he has much greater ability to ignore questions. Still, the frequency and manner of Trump’s engagement with reporters won’t matter, if his answers are as vague and unsatisfying as they were at Wednesday’s press conference.